The Wong Kar Wai directed THE GRANDMASTERS (YUT DOI JUNG SI) performed decently in Asian and finally landed in the U.S. at its first promotional stop in New York. A premiere was held two days ago. Leads Tony Leung Chiu Wai and Zhang Ziyi along with director Wong Kar Wai attended. 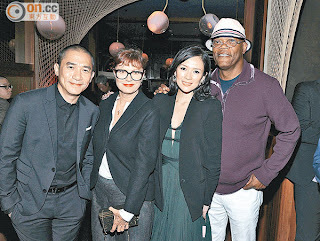 Oscar Best Actress Susan Sarandon, Hollywood star Samuel L. Jackson and Feng Xiaogang showed their support. The Academy Award winning Best Actress Susan Sarandon gave high praises to Cannes Best Actor Leung Chiu Wai's portrayal of the Grand Master. THE GRANDMASTERS Iron Triangle of Wong Kar Wai, Leung Chiu Wai and Zhang Ziyi arrived in New York to begin the first stop of their U.S. promotional tour. Later they will go to Chicago, Los Angeles, San Francisco and other locations to continue the promotion. At the premiere, aside from Mr. and Mrs. Wong Kar Wai, Leung Chiu Wai and Zhang Ziyi, DEAD MAN WALKING's Oscar Best Actress Susan Sarandon and famous Hollywood star Samuel L. Jackson showed their support. Sam Jackson said that he came because of his appreciation of director Wong Kar Wai. Others included famous Mainland director Feng Xiaogang, famous fashion designers Vivienne Tam and Ann Sui. However Carina Lau Ka Ling's absence made people speculate whether Leung Chiu Wai's recent rumor with Zhou Xun has upset Mrs. Leung? Actually Ka Ling was at work and was unable to keep Wai Jai company. THE GRANDMASTERS received great word of mouth and ideal box office in Asia and caught just as much attention in the U.S. Wong Kar Wai edited the film anew so it would be easier for foreigners to comprehend. Wai Jai at the press conference revealed that the most memorable was working for 40 consecutive nights. He said that in the end he only had bronchitis and was lucky not to have pneumonia. Zhang Ziyi appeared on GOOD MORNING AMERICA for a live interview. She even admitted that a live program appearance required courage, luckily she was able to withstand the test. Zhang Ziyi's English ability was made fun of before, thus she worked hard to learn English. Now she is able to fluently respond on a live program, she truly is a new and improved "International Zhang".